David James Group (DJG) worked with the Acoustical Society of America (ASA) to rebrand their organization for the first time in 88 years. ASA sought to be more easily recognized by the acoustics community as one of the leading interdisciplinary acoustics societies with a modernized brand and a clear identity, mission and values. A primary goal of the rebrand was to update ASA’s organizational identity. The first step was creating a new logo that paid tribute to the history and interdisciplinary heritage of ASA, while maintaining a modern look and feel reflective of the organization’s mission. For any brand identity to be successful, it must let the viewer know instantly what it is representing, be easily identifiable with the organization and also lend itself well for every possible type of media presentation. DJG set out to create a new logo that conveyed this preeminent interdisciplinary acoustical society as a progressive and forward-thinking member-based organization, while at the same time paying homage to its rich history. The ASA Logomark takes inspiration from a circular wave pattern used in the organization's legacy logo. The blue dot at the center represents an organization from which innovation in acoustical science emanates, while the individual dots that form the wave pattern reflect a society comprised of individuals with diverse focuses, backgrounds, and experiences. The ASA initials and full name are set in a classic serif font. Elegant and timeless, this updated typeface reflects a society that values scientific rigor and the sharing of knowledge. The color blue has played an important part in ASA's brand heritage. The deeper blue adds a feeling of trust and stability while the brighter blue infuses energy and optimism. Along with the new master brand, we developed a complete brand identity system, brand guidelines, and other supporting materials. 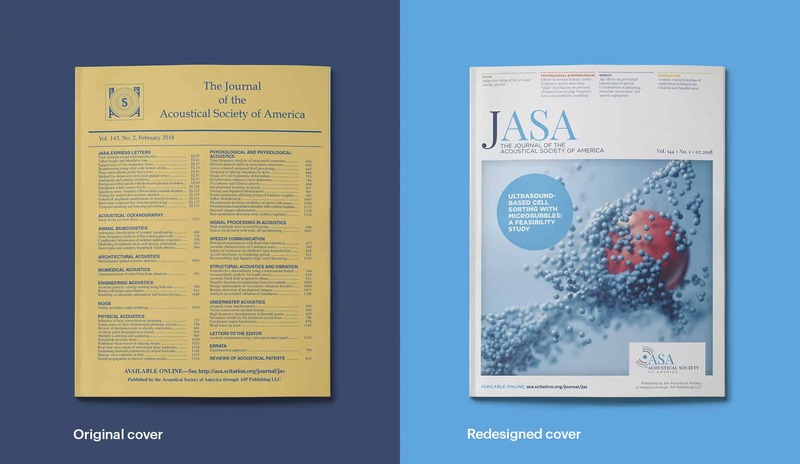 Dovetailing the new brand identity, ASA determined that a redesign of their flagship publication, the Journal of Acoustical Society of America, commonly referred to as JASA, was necessary. They felt it was critical to bring this prestigious and valued publication up-to-date in order to provide a consistent ASA brand experience to readers. Consequently, they wanted to convey a modern, yet timeless, feel that would appeal to today's acoustician, particularly those beginning their career. ASA partnered with DJG to redesign the cover. DJG also developed a strategy for cover photos for each issue; interior page redesign, including table of contents, editor listing, etc. ; back cover feature article strategy and design; and matching graphics for their digital properties. The ASA rebrand positioned this scientific society as highly credible and progressive. Email us or use our live chat feature below to learn about how you can cause a stir with brand building. PrevPreviousWhat is a websites “Look and Feel”?